Yesterday was your typical west coast New Years Day. The temperature hovered around 6 or 7 degrees Celsius, and it was grey and drizzly. As I do most New Year's Days I take down the Christmas decorations and sweep up the needles from our artificial tree. I went out to the work shop to get the boxes for the ornaments. On the floor was a bright green and yellow tuft of fibre I must have dyed on one of my all night fibre dying sessions ( a story for a future post). It probably fell out of one of my boxes when I was rooting around in them just before Christmas. I scooped up this soft cheerful little gem and stuffed it I my pocket thinking I would put it back when I brought the decorations back out to the shop. I have very mixed emotions about the Christmas tree. I hate putting the bloody thing up. It usually requires a stiff drink and some choice words. I do though love to sit in the dark with only the Christmas tree lit up. This also involves a drink. Once Christmas is over I can't wait to take it down but I get quite emotional as I carefully pack up each ornament as they all have a history attached to them. Yesterday I was going to have that sucker down in 15 minutes tops I figured. No emotions, just get her done. I would have too except for this little tuft of happy green and yellow fibre. I started out well. I brought in the boxes, pulled the tree out from the corner, untwisted the twist tie that held the extension cord at the base of the tree, put the twist tie in my pocket and " oh that is so soft". I sat down on the couch to examine this friendly fluff ball. It was kind of like that episode of Star Trek with the tribbles. I was hooked. This lovely specimen of sweetness and light on a dull winters day needed to be something. Off I went for my drop spindle. Christmas tree? What Christmas tree. I spent the next 2 hours turning my bright green and yellow tuft of fluff into 10 yards of 3 ply bright green and yellow yarn. Now you think that this would have somehow satisfied my need to create with this wondrous stuff and I could get back to the task at hand which was taking down the tree. I mean boxes were all over the floor and the tree sat in the center of the living room. Of course this was not the case. How could I leave this 10 yards of happiness to just sit on my spindle and be forgotten? I mean I just spent 2 hours creating this masterpiece it needed a higher purpose. So what do you do with 10 yards of green and yellow yarn? You weave a square. First though you must get the square that you have already started on the loom, off the loom. I couldn't just pull it off, I had to finish it. So after a half hour finishing the first square then another half hour weaving the second with my newly made ray of sunshine I had a 4 inch bright green and yellow square. Now only 150 more and I'd have a blanket. Many hours later the tree and decorations were finally packed away, but that tuft of fluff was a much more interesting way to spend a typical west coast New Years Day. Christmas is over, the carnage of the day put away and we are a few days from the start of a new year. I am still feeling the effects of all the food and drink and feel quite toxic. Today I will go and join the human race but a force stronger than me tells me to stay home. What is this force you ask? 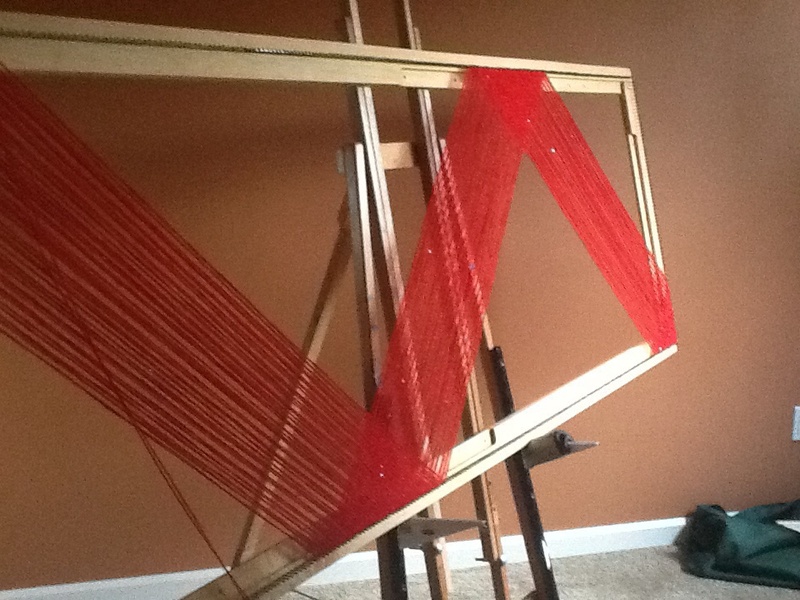 A new loom arrived in my home this Christmas and it is begging me to stay home and play. My head is filled with possibilities. 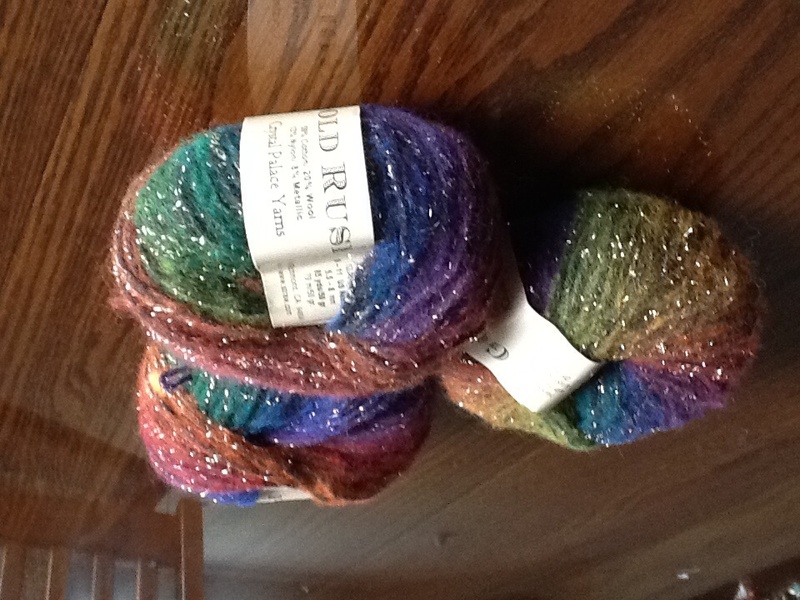 Yarns that I had set aside for other projects are being redirected in my head for new experiments. 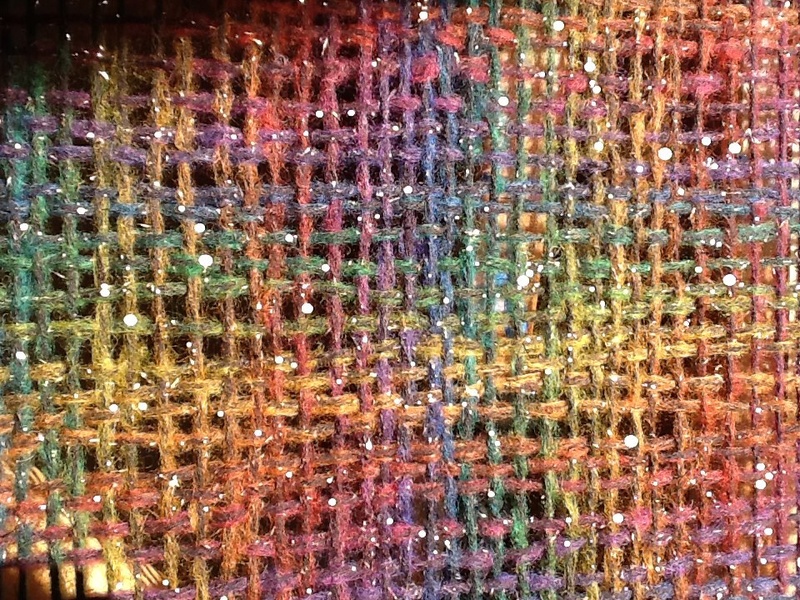 New weaves and colour combinations are running wild in my mind. I could print on the fabric or maybe embroider an interesting border. Oh my! don't even get me started on borders. A few more days and the holidays are over. Life will settle back into it's daily routines. A new year will have begun and with it the hope of happier, healthier more prosperous days. For me, I am planning to focus more of time on my fibre pursuits. Spinning, weaving, knitting where will it take me this year? But first, the January yarn sales! Wishing you all a happy, creative New Year! Normally I like to keep all things Christmas in the month of December but I work in a chocolate shop and so my very soul is owned until December 24th. 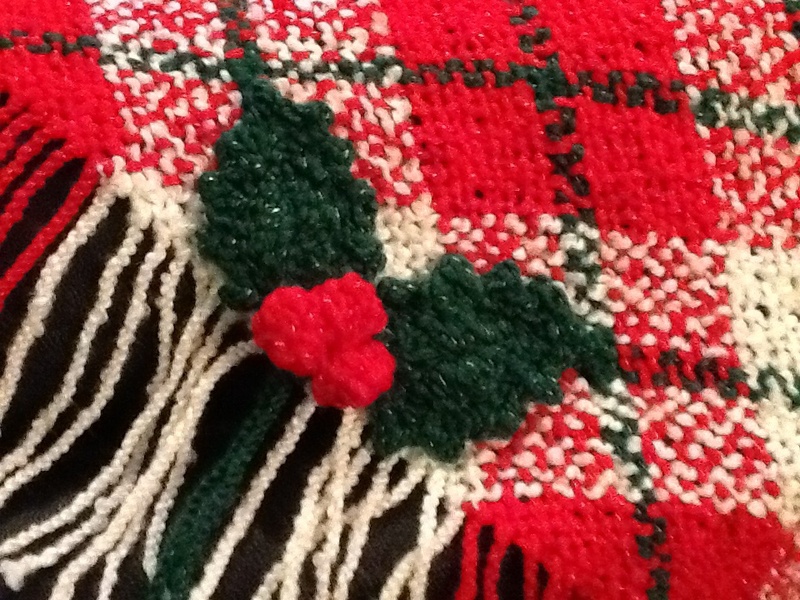 I really wanted to create a shawl for the holidays so here is my contribution to the holiday festivities. My studio is at the back of my home and south facing. 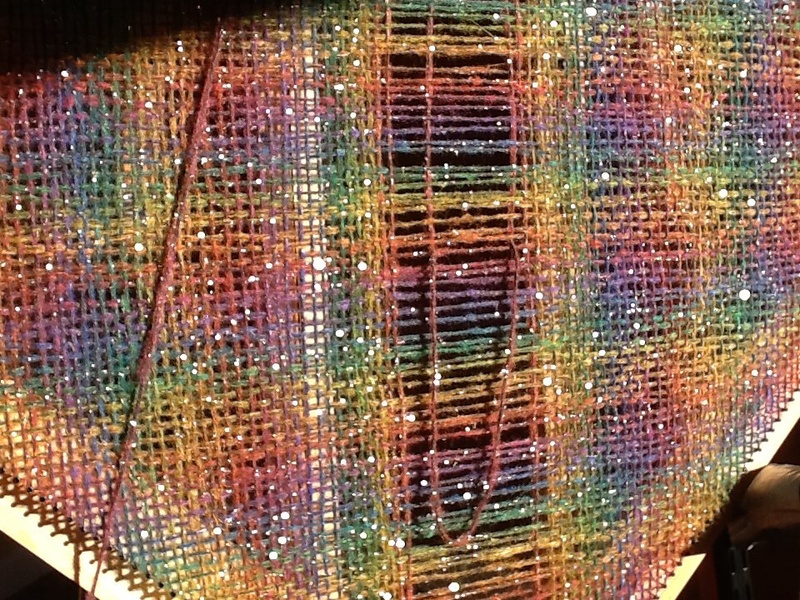 Not only do I get to feel the sun on a cool November day but as the sun swings around different parts of my weaving light up. This morning was magical. I just can't resist something colourful and sparkly. A party shawl perhaps?